I ask the question of the audience: you’d necessarily need a critical size to generate enough money. But audience is not the key factor for Vimeo: quality of contents & word-of-mouth among a high-level & passionated community of creators is key. Because as a good CRM, you naturally remove “bad payers” & keep great experience. In the long-tail, it means that even what is extremely niche is potentially a great entertainment. So great value. Vimeo does not run after “buzz” coming from TV show or from video-clips. Vimeo runs after exclusive & original contents (for instance, a live that you would have filmed in a place where no TV went). The Vimeo Festival + Awards — Chris Crutchfield from Chris Crutchfield on Vimeo. This being the first year of the Festival and Awards, we are going all out. We have secured awesome judges to evaluate your work in a variety of categories and a jam-packed two day festival of events and education to let everyone join in on the fun. An Awards show will culminate the Festival in an entertaining evening of celebration, honoring the individual category winners. Award winners will be heavily promoted on Vimeo and the winner of the Best Video award across all categories will win a $25,000 grant to produce new work as well. That’s a lot of moolah, because we’re committed to supporting the creative community, and want to do our part to enable exciting new artists. 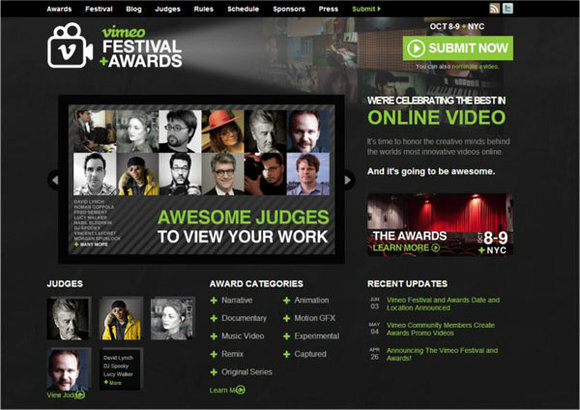 To submit your work, visit vimeoawards.com/submit. We can’t wait to see what you’ve got!